The bench press is perhaps the most popular exercise among bodybuilders and power lifters. It’s simple to perform, it’s highly effective (and a compound movement meaning it affects many muscle groups) and it’s a great measure of strength that can be used to compare overall strength and measure gains. As such then, it’s highly frustrating when something stops you from being able to perform the exercise at your best, and if you are forced to halt your progress. One thing that can commonly cause lifters to have to lay off the bench though, and which is seldom addressed, is pain developing in the sternum that worsens during lifting. This is a fairly common issue, though asking around it seems that few people know the precise cause. Here then we will look at what may lead to it, and how you can address it. One obvious cause of sternum pain during bench press is bouncing the bar off of your chest. This is something that many lifters will do almost unconsciously but which can clearly lead to bruising over time – even if it seems minor at first. Bouncing the weight off your chest is also essentially ‘cheating’ as it means you’ll be getting help at the bottom of the movement, so that’s another reason to cut it out. In other cases though, the precise cause may be more difficult to identify. In this case the pain can probably be described broadly as costochondritis which is pain experienced in the chest wall and sternum and which is usually benign. 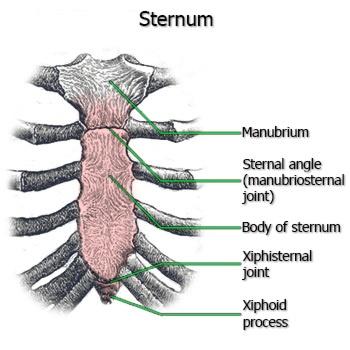 This is caused by inflammation of the costal cartilage around the costosternal joint. This is the cartilage that joins the ribs to the sternum and which gives the chest cavity its flexibility. While it may be hard to identify precisely what ’caused’ this pain, in general it can result from direct trauma (so again with the bouncing), arthritis, strenuous lifting (quite likely… ), coughing, infection or tumour. The latter two are quite unlikely, though it’s still worth checking with your doctor if you’re concerned. If it is an infection then a course of antibiotics should sort you out, while a tumour may require surgery. More likely though the best treatment will be rest – but you knew that already didn’t you? The condition is usually benign and self-limiting, so if you simply cut out the bench press for a bit that should be enough to allow you to recover. To combat pain meanwhile you might also be able to use analgesics or anti-inflammatories. Failing this, if the condition seems chronic and won’t improve then your doctor may be able to administer a cortisone injection – though don’t expect that to be pleasant. In future to prevent a repeat performance, make sure to stretch your chest area thoroughly, to warm up before exercise and to avoid over exertion where it’s excessive. Thanks for the write up. You're correct that nobody really seems to know much about this. When you try to describe the chest pains people suggest heartburn or something else, but I know this is a lifting injury because I was doing a new chest fly angle.